Eating snow will only lower your core body temperature and make you more susceptible to hypothermia. Yes, even in the harsh cold winter it is necessary to hydrate. 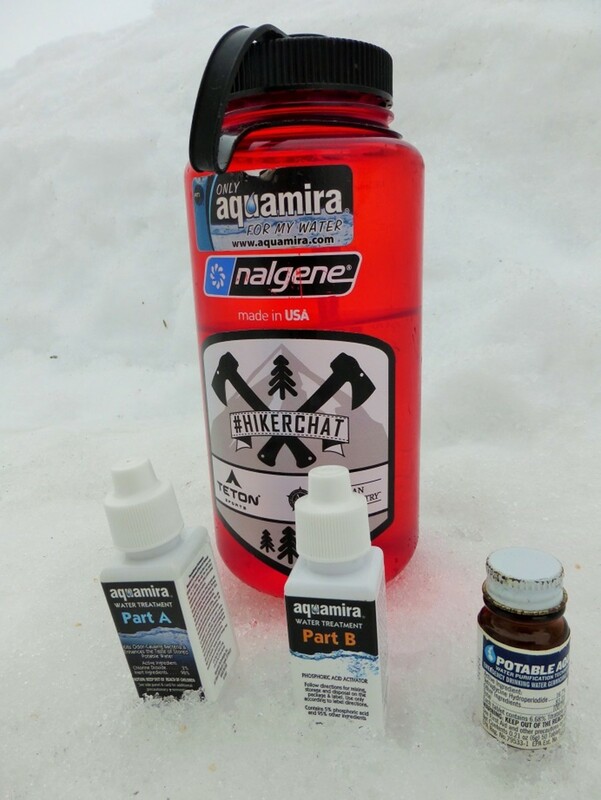 For dehydration is a real threat to the backpacker during the snowy months too. So, start pumping water from your filter into your camelbak bladder and ... oh wait a minute, scratch that. That's right, after your filter freezes and cracks you won't be able to purify water anymore, but that's okay your water bladder is now a frozen block of ice conveniently located on your back. The winter backpacker must change their tactics for gathering, purifying, and carrying water. So much water does a person need? A study by the Institute of Medicine concluded that an adult male requires about 3 liters of water per day, and a woman must have an intake of 2.2 liters per day. However, with increased energy output, sweating, and water loss through heavy respiration the winter hiker requires additional water intake. Though everyone's bodies have different requirements, many mountaineers agree that you need to drink about 3/4 to 1 liter of water for every hour of trekking through the snow. Yes, that's a lot of water! A good strategy, is to be well hydrated for several days before venturing into the cold. If you start mildly dehydrated - things are only going to get worse. Many backpackers also pound an electrolyte-rich drink just before heading out on the trail. Also, make sure your water bottles are topped off (and unfrozen) before heading out. Most importantly, watch your pee! Yes, watch for the color variations in your urine; you want it to be as clear as possible. If your pee is that dark yellow, STOP and drink water. 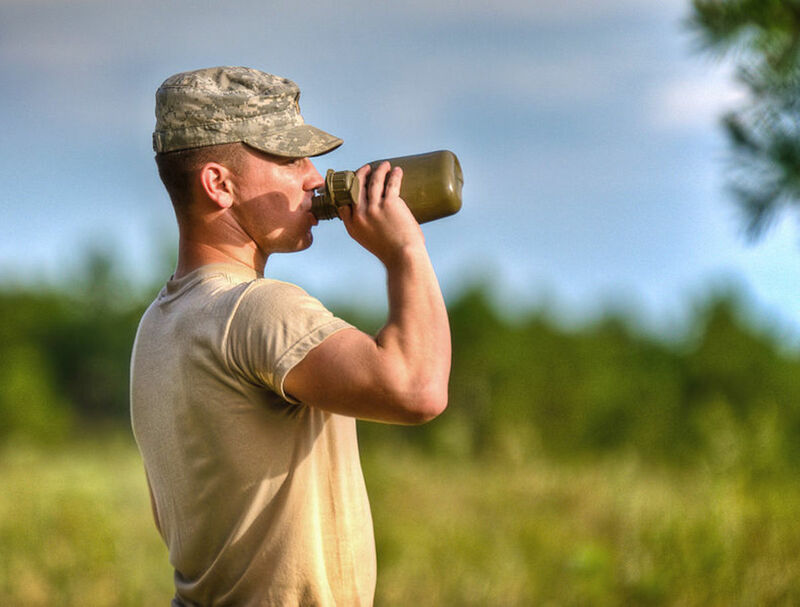 If you are dehydrated, STOP, make yourself comfortable and safe. Start sipping water and eat some salty electrolyte-rich food. You may want to make camp for the night. Don't start hiking until, you are well hydrated. Simple, right? 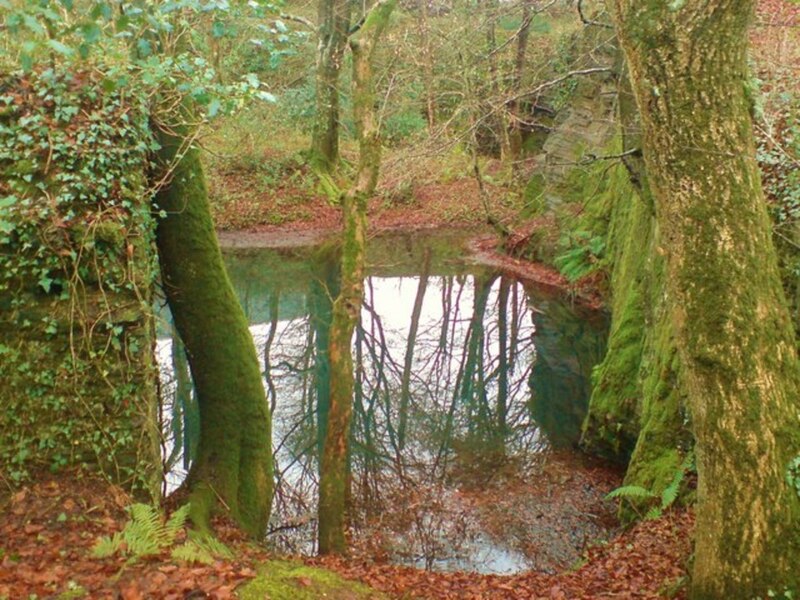 Just go down to the lake, dip, and voila - water is gathered. Well, maybe - but usually is goes something like this. "There was a lake here, wasn't there?" "All I see is a big snow field; check the GPS again." "Okay, according to this we should be right in the middle of it." "You're a moron, give me that thing! Hey, do you hear a weird cracking sound? " Yep, finding open water in winter can be difficult and when you start looking out on the ice, it can be dangerous. And in the backcountry accidents on ice are usually deadly. Though snow melting is a fantastic way to "make water," it has a high fuel cost and is time intensive. Therefore, whenever an open source of water can be safely accessed, it is more energy and time efficient. First of all, be careful whenever venturing onto or nearby ice. Test the ice with a trekking pole and try to stand on logs or rocks as you dip or chip into the ice. Again, standing in the middle of a pond, hammering on the ice with an axe may not be the best idea. 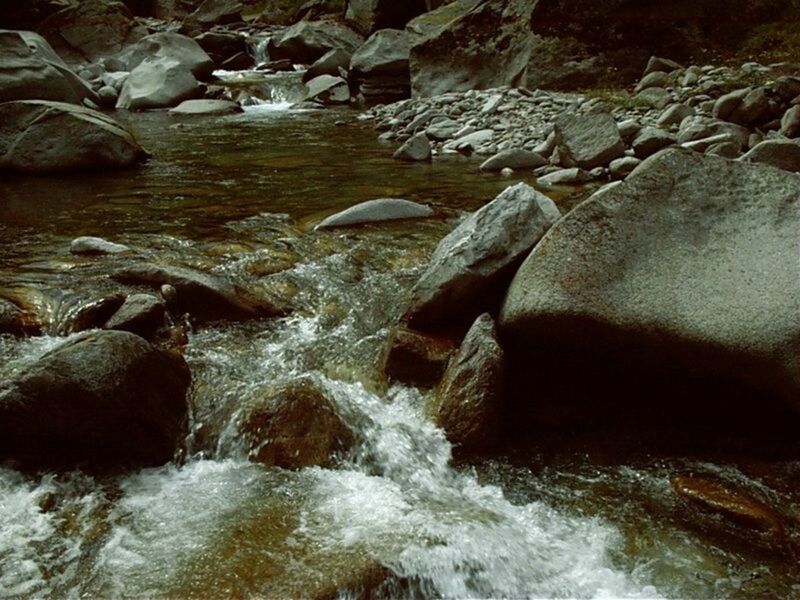 Often fast moving streams are good sources of easily accessed water as the ice generally isn't too thick. Extend your reach by attaching your water bottle to the end of your trekking pole. To do this use a small piece of para cord to tie the bail of your wide-mouthed nalgene to the end of your trekking pole. For the knot-challenged, use a carabiner to clip the canteen to the hiking pole wrist strap. Sometimes the bails wear out on nalgenes, so tie a small piece of para cord below the threaded lip for water dipping. 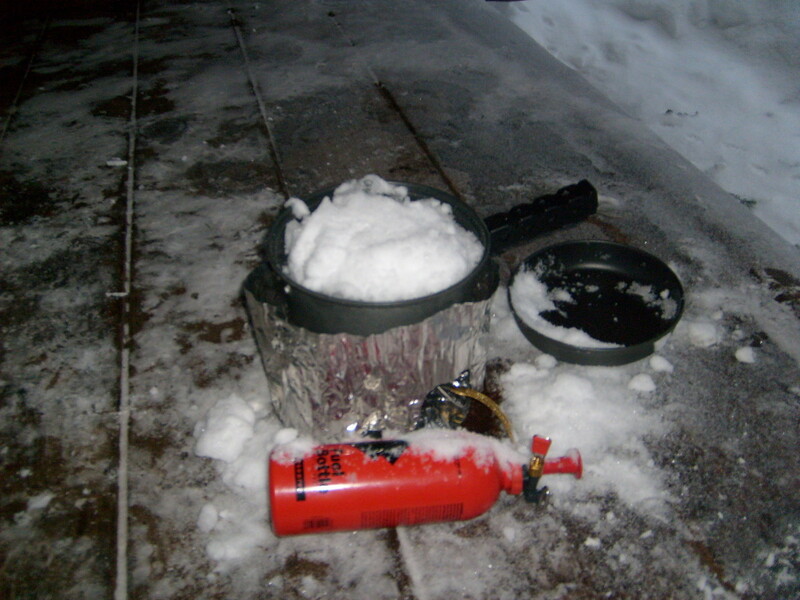 If you plan on melting snow and cooking, plan on carrying about 8 oz of fuel per person per day for your white gas stove. 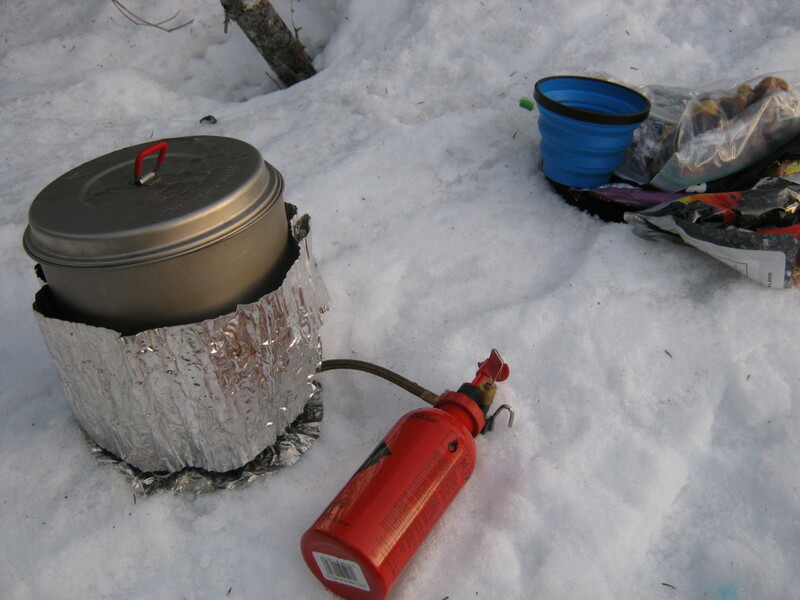 Note: stove fuel economy differs between models so field test your stove before using it in the backcountry. Making water is simple, we all know the formula just create a covalent molecular bond between one oxygen and two hydrogen atoms - easy, duh. I'm not sure exactly how to do that though, so try making water by melting snow. The advantage of melting snow is that melted snow is usually safe to drink, but remember don't scoop yellow or pink snow to put in your pot. To be safe, all water should be considered contaminated. You could bring the water up to a boil; however that takes time and will increase fuel consumption. A more energy efficient way of making sure melted snow is safe to drink, is to filter large particulates out with a bandana or coffee filter into a water bottle, then treat the water chemically or with a UV lamp. Set stove up in a safe level area out of the wind. Compact snow underneath for a steady platform. Gather large amount of clean snow - a garbage bag works well. If you do have a garbage bag, gather snow in the morning and leave it in the sun to start a solar melting process. Erect wind screens, prime, and light stove. Place small amount of water in cooking pot and place on stove. The water will stop your pot from scorching as well as speed up the melting process. Keep about an inch of water in the pot at all times during the melting process. Start scooping snow into the pot. 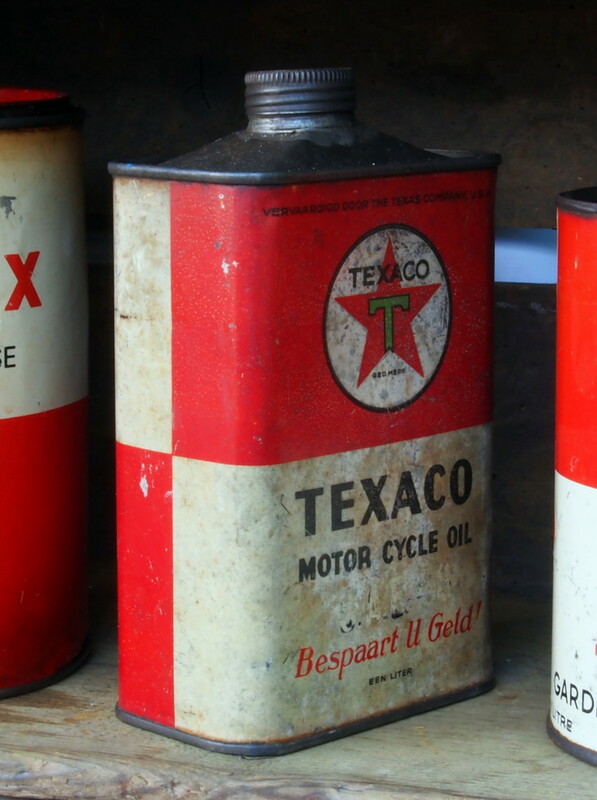 Be sure to keep pot lid on as much as possible to conserve fuel. As snow melts, keep on adding more snow to the pot. Depending on the denseness of the snow, it may take up to 10 quarts of snow to produce 1 quart of water. Stir the snow into the melted water with a stick to speed the meting process. Remove water from pot with a water dipper (AKA cup) and pour into water bottles. Filter out particulates (usually pine needles) pour the water through a bandanna or a coffee filter. The MSR mug mate coffee filter works great. 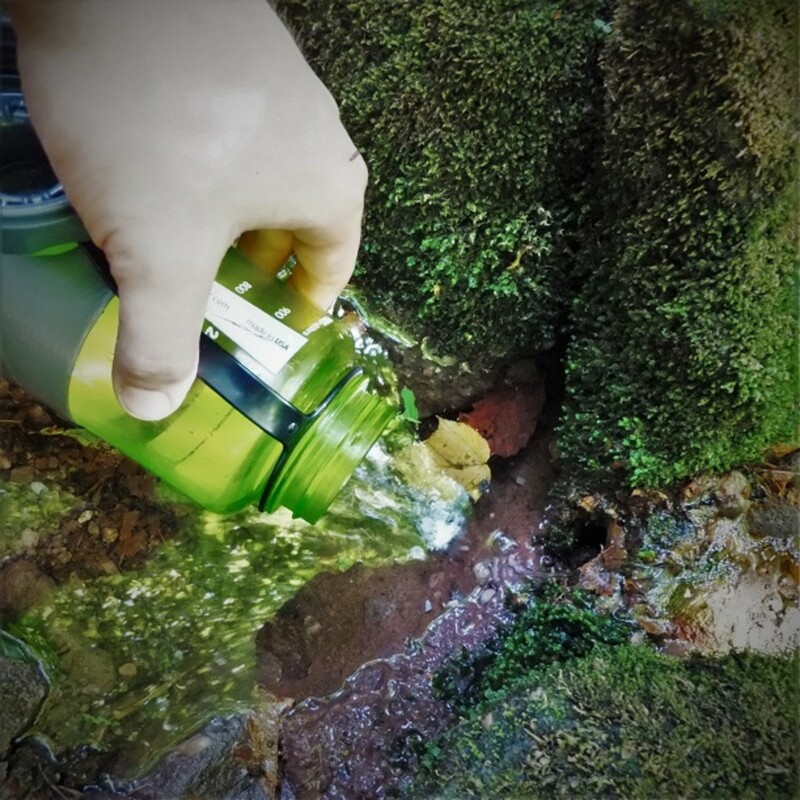 Many 3-season backpackers rely on water pumps to filter their water; however, in winter filters can be a bad idea. What happens in freezing temperatures, is that residual water freezes inside the filter mechanism resulting in blown seals and cracked housings. The only real way to depend on a filter in freezing temps is to dry it out as much as possible and then keep it from freezing by carrying it in your jacket. Chemicals are a great way to treat winter water, however most treatments are ineffective in cold water. Often water must be heated, in order for the chemicals to do their magic. One great method, is to melt snow to the point of "slightly warm" and then use chemicals. This practice requires less fuel and increases the effectiveness of your treatment. One of the most popular winter water treatments is Aquamira. Aquamira is a two part chlorine dioxide treatment which neutralizes waterborne pathogens without an aftertaste in about 30 minutes. Best of all, Aquamira works better in colder water temperatures than traditional iodine tablets. Though Aquamira is freeze-thaw stable, it can still freeze. In extremely cold temperatures, place both bottles inside your parka to keep them from freezing. In the past few years, using UV light to purify water has become a lightweight and popular way to treat water. These battery powered devices, use UV light to disrupt the DNA of microorganisms and render the little water beasties harmless. SteriPEN is the leader is producing travel sized UV lamps for rugged backcountry use. Some models have solar charging capabilities so you don't have to worry about batteries for extended trips. So how do you use a SteriPEN? Though each model differs, generally you turn on the switch, plunge the pen into the water, then stir until the light goes out (usually about a minute). After that, there is no wait and no taste - just drink. The UV light does not purify contaminated water droplets that may be on the bottle lid or threads, so be careful to clean the threads before placing your lips on the container to drink. So where do you put the water after you gathered and purified it? Hydration bladders are outstanding during the warmer months, however in the winter the bladder, the tube, and the bite valve can freeze easily. Camelbak does sell a thermal control kit to use with their bladders, but the neoprene insulation doesn't withstand the most extreme of temperatures. Remember after taking a sip, to blow back into the tube to clear the hose; the hose is usually the first thing to freeze. 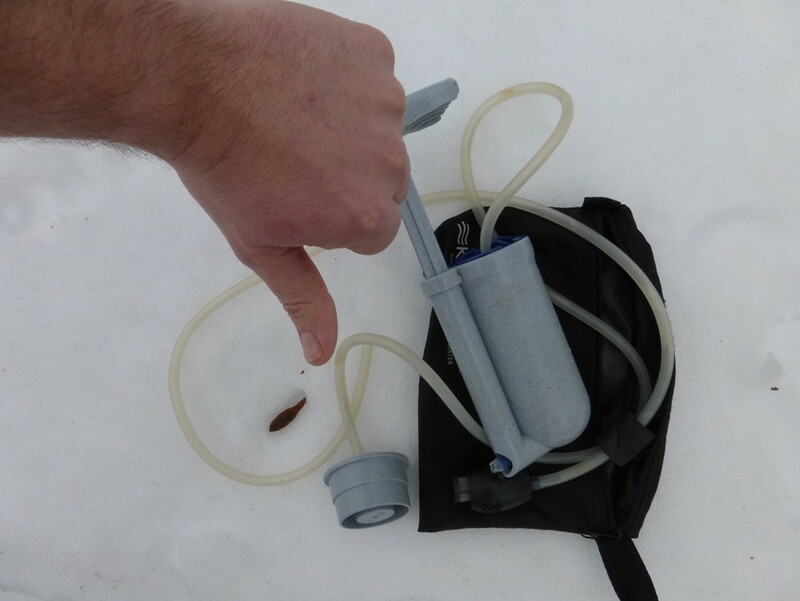 Generally winter backpackers avoid hydration bladders because of the difficulty in keeping them unfrozen. Specially made insulated water bottle holders and wide mouthed water bottles are the thing to use while winter backpacking. For example, the Water Bottle Parka from Outdoor Research is a staple in mountaineering and are practically indestructible. If economy is the hiker's primary need, then insulate water bottles with an old wool hiking sock. Sock gnomes never take socks in pairs, so most backpackers have a mismatched sock or two in their sock drawer. The crafty backpacker can also make their own insulated water bottle cover with an old piece of closed cell foam and some glue. Most backpackers and mountaineers opt to keep water bottles from freezing at night by placing bottles in their sleeping bag. One way to keep warmer at night is to fill a water bottle with hot water and put it in your sleeping bag. Because snow is an excellent insulator, water bottles can also be buried in the snow to prevent them from freezing. Burying water is a good technique when dealing with large amounts of group water. 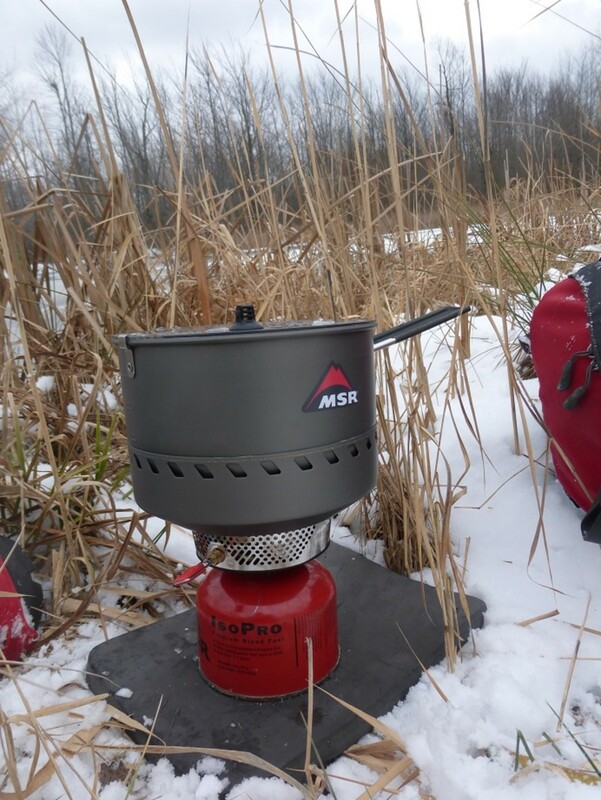 What is your favorite method of having water for winter backpacking? Crossing the Gully: An Adirondack Winter Adventure. Outbound Dan Human recounts the true story of a dangerous adventure in the Adirondack backcountry. Though it started off as a simple solo snowshoeing trip, a momentary lack of safety protocol pits him against potential death. Though I, and many of us, ate snow as kids (and we are still alive) it is one of those things one must be careful doing. This is especially true if we are going to be outside for any length of time as hypothermia can set in rather quickly. Thanks for the comment jellygator! I'm not a backpacker, but Kansas City does get quite a bit of snow, and I didn't know that eating it could make someone susceptible to hypothermia. Good info to keep in mind when I'm watching the grandbabies. Thank you! Thanks for reading and commenting Swetankraj and Troym! I'm leaving soon for a frozen wilderness trek, so I better get off hubpages and pack up the car. Great hub and really deservs hub of the day. It helps me a lot and a good guide in surviving in these days and very helpful! Thanks to everyone for the kind compliments on this article and the congratulatory remarks for "Hub of the Day" - I appreciate it. 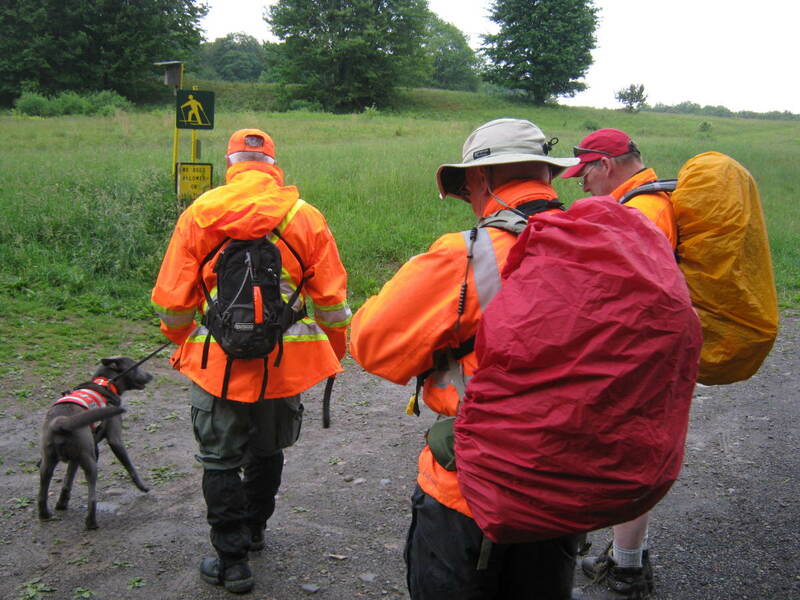 Knowing how to acquire and treat water for safety is an important survival skill and you never know when you will need it an emergency. For those of you that have never been winter backpacking, it is an exhilarating experience full of still beauty and resulting in great stories. It is also a dangerous time to explore our environment so read all you can and go out with an experienced winter camper before going out for your first time. Start by going out for winter day hikes and see if your body can stand the cold. 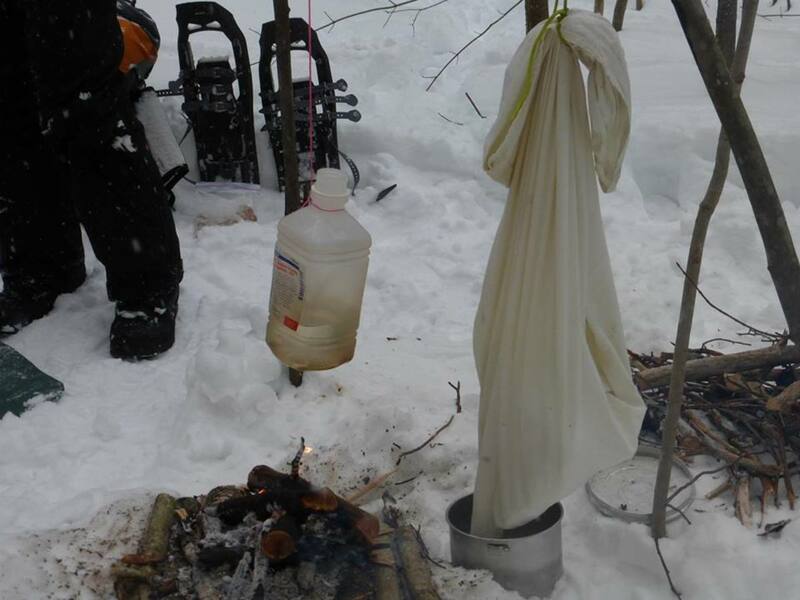 Practice techniques like making water, building winter shelters cooking and eating with mittens, and regulating body temperature. Thanks again and good hiking to you! Interesting and important information on safe drinking water in the winter. Even if one does not hike in the winter, we never know when a disaster could require knowledge like this. Thanks, for I would not have expected purifying chemicals to be ineffective in cold weather. Well done and congrats on Hub of the Day! I do hike but not been brave enough for winter hiking, but boy is all this information interesting about water for many reasons. Excellent hub Dan. Voted up and followed! I never hike but this was interesting and may be useful if someday I do hike! Thanks! Awesome write up on this very important topic. No doubt I've been out in the field without being properly hydrated and the only reason I'm writing this was I had the advantage of proper medical care immediately upon diagnosis of heat stroke. Not everyone will have bags of saline and an IV right on the spot. Great info and upvoted! Love the sample "Finding Water" conversation. Will keep your tips in mind. Rarely hike in the snow, however, mostly because no one will go with me! Great hub. Congrats on HOTD. It's well deserved. We have only taken short hikes in the winter, and even those little forays into the wild can make us really thirsty. What a great article on keeping hydrated for those who are trekking out into the frozen wilderness - I think our first backpacking trek will be made in warmer weather, though! Thanks John. I know sometimes that I am so smitten with the environment or so obsessed with reaching my goal that I forget to drink as much as I should. I force myself to drink whenever I take a picture or fool with my GPS. Many sport watches have hydration alarms that also remind you to drink too. While I have no intentions of hiking in the winter, I do go out in the snow to play with my kids. I know how thirsty I can get just doing that! I wish I had seen this just a year or so earlier, though, when I would drive through the mountains in the winter. If my car ever broke down, I would have to hike down snow covered mountains, hence my need to know about how to find safe drinking water and how to store it as I hiked. This is a great resource for all backpackers who go out in the winter! Thanks for the detailed tips and information. Congrats on getting Hub of the Day! Great hub. Yes, I have real problems drinking water and I'm rarely if ever thirsty---which makes it worse. I usually carry a water bottle around and have to force myself to drink.... Thanks for the advice! Wow, Hub of the Day - sweet. Thanks everyone for reading! @Cclitgirl and MosLadder good luck if you do embark on some winter backcountry adventures of your own. Great hub OutboundDan, and congrats on hub o' the day!. This whole backpacking in the snow idea is making me want to get to the mountains. Thorough, informative hub, voted up.Cheers! Ha, though I think jumping into a frozen lake would best be punctuated with counseling from a mental health professional or perhaps your own reality TV series. Though those two options are closely related. Simone, you gave me a great idea though for a gear review of various battery-powered garments. Thanks! Hahaa, no kidding! And the venture would best be punctuated with one of those fabulous battery-heated jackets. Thanks Simone for stopping by. Of course in the winter you can always jump into lakes too when the spirit take you. However, it helps when you are wearing an ice rescue dry suit. Gosh... backpacking is intense as it is. Doing so in the winter seems unthinkable- mostly because I hate the idea of being outdoors and not being able to jump into lakes and streams I happen upon. I'm really careful about using filters and/or iodine, but snow adds a whole new bunch of steps... yeesh! At any rate, this guide is stellar. Thanks so much for sharing the good advice! You are welcome Damselfly. I think if we did a test at any one time, we'd find that most people are actually dehydrated. That's why before a trip, I force myself to be hydrated for several days ahead of time. I also try to eat a little healthier too. Thanks Dan for the useful information. I also like your comments about hydrating a couple of days before the hike! It has worked out very well for me! Thanks Steve! 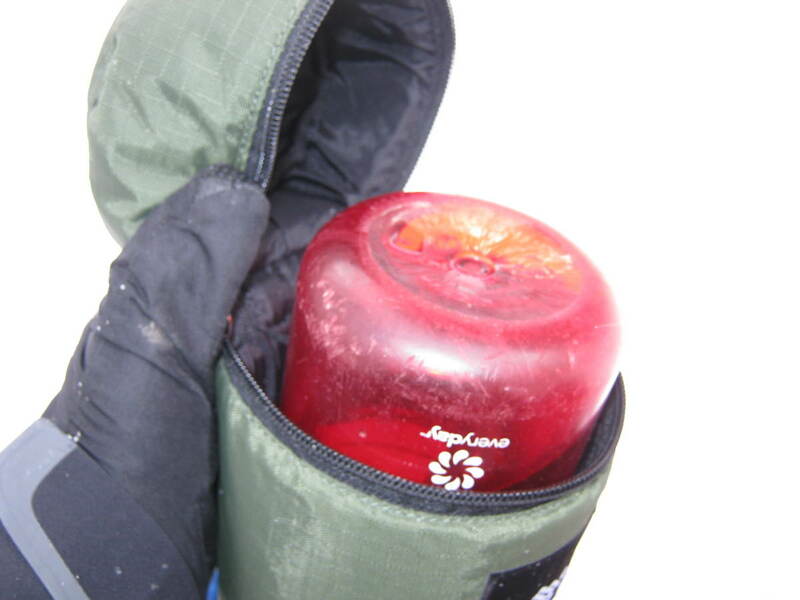 That's a great idea to use the rest of your sled gear to insulate your water bottles. A puffy jacket in your pack does very well at insulating. Great article OBD. I used to tell my students that you have to think of camping in the winter as camping in a desert. The air is dry and you will lose more water breathing then during the warmer months. 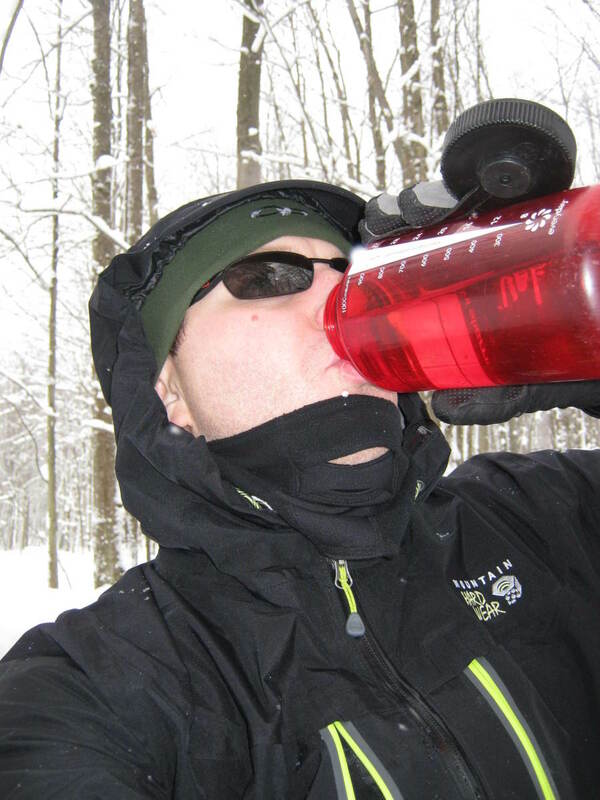 When backpacking in the winter I like to pack my water bottles closer to my back then usual. Some of the heat leaving my body helps to keep it liquid. When I'm only carrying a small pack and pulling most of my gear in a sled I put the water in the center of the pile to use all my other gear as insulation. 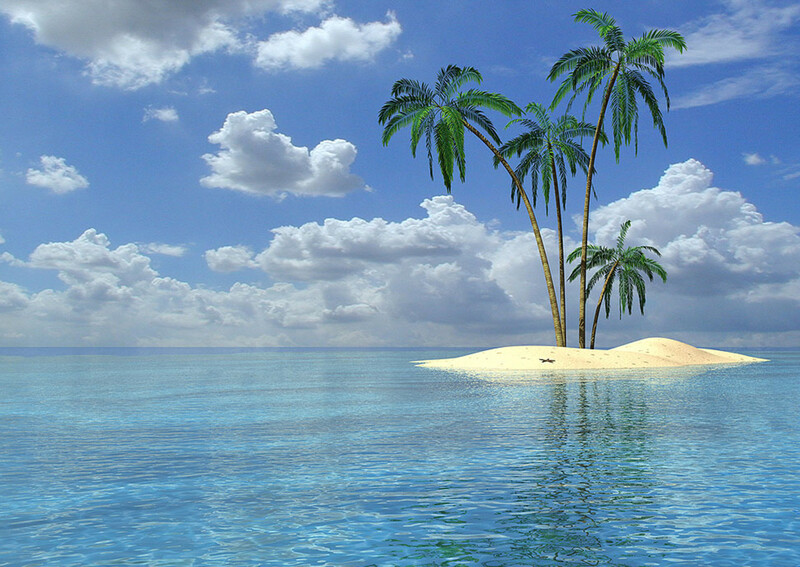 Thanks TheEpicJourney for reading and commenting. 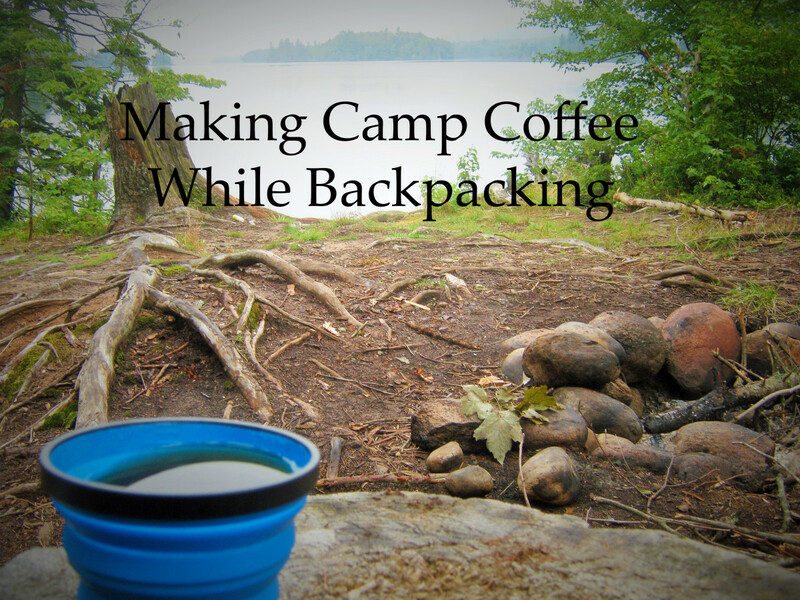 Yeah, during one of my first backpacking trips I found my canteens frozen solid. I ended up thawing them in my parka - not a pleasant experience. 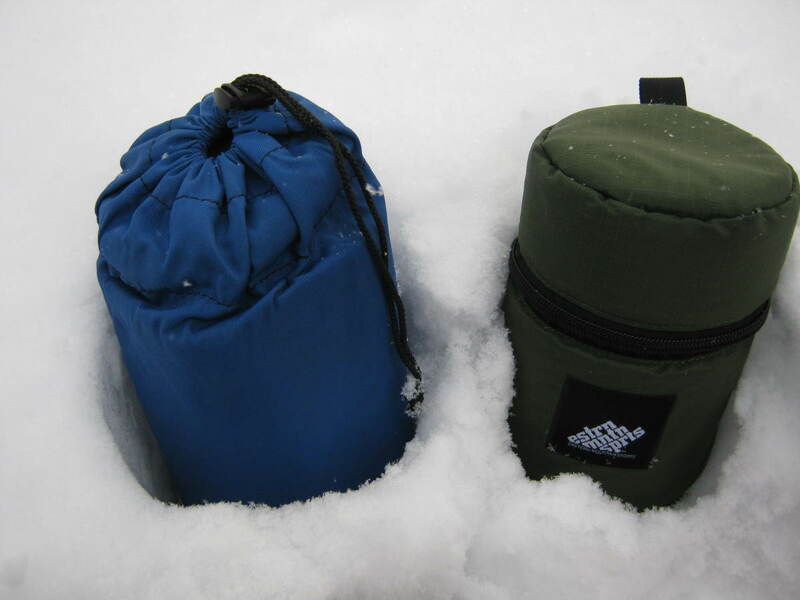 Good luck on making your own insulated bottle carriers. Another very informative and helpful hub Dan! I've not been on many winter hikes, but I want to, and I had not even thought of the issue of my water freezing! This probably saved me a lot of hassle and thirst when I do get out in the frozen wilderness! Now I know to prepare for that. Great tips, I love the sock idea and making my own insulation with foam, the nalgene upside down trick another thirst saver. Thanks!